This is part one of a two-part article about gym floor matting. Every building owner or facility executive can make a case for needing to protect his or her floors from grime and wear — but those with gymnasiums probably have more reason to do so than almost anyone else. 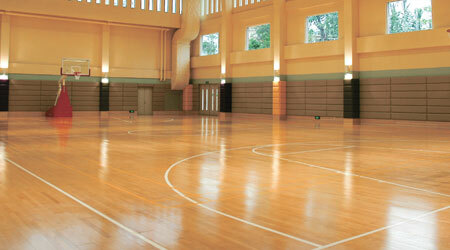 After all, the most important element in a gymnasium is the floor. That surface needs to have a particular finish that’s consistent across the entire area, and if the surface is wet or the finish is damaged, an athlete could be hurt by a nasty fall. Even without these larger worries, if cleaning professionals don’t take preventative measures, constant foot traffic over gymnasium floors can wear down the sheen. That means they need to be refinished on a more frequent basis, which costs much more in the long run than simple upkeep. Distributors can provide the proper matting products and dispense advice to their customers to ensure gymnasium floors stay sparkling longer. Eighty percent of the dirt in a building comes from outside, says Scott Andersen, vice president of sales with The Andersen Company, Dalton, Georgia. That’s why protection of a gymnasium floor starts before anyone even enters the building. Building service contractors or facility managers should place 30 feet of matting, starting with 10 feet of scraper matting on the immediate outside of the building, then 10 feet of scraper or scraper/wiper matting between the double entry doors of the vestibule, and finally, 10 feet of carpet or wiper matting inside the entryway, says Aaron Mills, marketing manager for workplace safety at 3M Commercial Solutions Division, St. Paul, Minnesota. The nature of the matting changes at each location. “You want open-backed matting on the outside so that dirt and particles can fall through it,” says Mills, noting that to clean these areas, end users can simply pick up the mats, sweep the areas underneath, then put them back into place. After knocking off the largest particles outside the building, cleaning professionals are working on small and intermediate-sized particles and moisture removal with the scraper/wiper matting. A bi-level surface prevents these particles from sitting on the surface, waiting to be picked up and carried further by the next visitor; instead they are filtered away from traffic, says Andersen. The final interior wiper matting might be a more traditional, carpet-topped mat to remove moisture from feet. In addition to the 30 feet of matting, end users might still consider placing a final 4-foot-by-6-foot or 5-foot-by-8-foot mat near the gymnasium floor to remove anything picked up on shoes at the last minute. Alternatively, Andersen suggests a sticky mat that functions like flypaper, in that tiny particles will be pulled from shoes immediately before walking on the gym floor. The top layer of this mat needs to removed and discarded periodically, but as long as end users do this, they’ll have a final level of defense against particles that might score the floor.